In 1815 Hougoumont was a small chateau and working farm less than 15km south of Brussels. On 18th June of that year it found itself between the Allied army under the Duke of Wellington and the invading French under Napoleon, and therefore a natural strongpoint for either side. Wellington garrisoned it with British Guards, Nassuers and Hanoverians, and these men successfully defended it against much larger numbers of French infantry all day, doing much to secure the Allied right flank and draining French strength that could have been better used elsewhere. Labelling the set as defenders of Hougoumont presents opportunities for some interesting and unusual poses. Many defenders stood on makeshift firing steps to fire down on attackers over the walls, while the famous incident when some 30 French soldiers broke into the farm and were fought hand-to-hand suggests poses using their bayonet or perhaps utilising the musket as a club. Such an opportunity has, however, been missed. What we find instead is a fair range of poses which could be described as generic Napoleonic but with nothing to particularly identify them as defenders of Hougoumont. This defence included the surrounding woods, gardens and orchards, so such poses are not out of place, but don’t really deliver what the name of the set might imply. 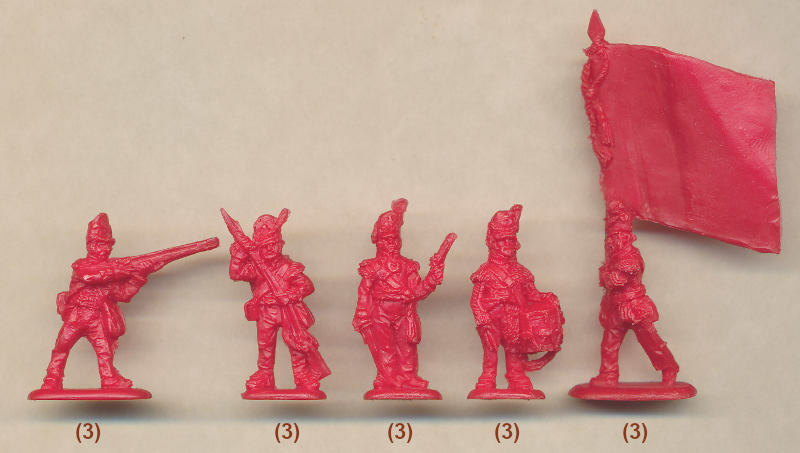 Because Waterloo was largely a defensive battle for the British infantry previous figure sets have mostly had static poses, so the many advancing poses in this set are a welcome change, even though again hardly suggestive of defending a strongpoint. The large number of kneeling poses are mainly useful for squares, while the officer, drummer and ensign are quite nice. However many of the poses are very flat and some are quite awkward - particularly some of those advancing. Both the firing poses are aiming high, just at the moment when you might expect figures aiming low - firing on troops from the tops of walls. As defenders of Hougoumont these must be Guards, although at this scale the differences between the Guards and other infantry disappear. All these figures wear 'wings' on their epaulettes, marking them as light infantry, of which there were many at Hougoumont. They also have their trousers outside their gaiters, which suggests they are not the 1st Foot Guards, which tucked theirs inside, but the Coldstreams or 3rd Foot Guards, which did not. Most have covers on their shakos, but a few do not, which may perhaps reflect the reality of the day, while some poses wear their knapsack - a perfectly possible situation although we would have thought that in defending a static position many men would have taken the chance to divest themselves of this item temporarily. In all other respects too the uniform is accurately done, although we were disappointed that so few men have fixed bayonets. Sadly those that are fixed are poorly done and have been fixed with the blade above the barrel, which is wrong, so to maintain accuracy some will prefer to trim these off anyway. The sculpting on these figures leaves plenty to be desired. We have already mentioned that the poses are often flat and awkward, and while there is a reasonable amount of detail it is often over-sized and chunky. Proportions are not impressive in places, and items often merge together or have bits missing, such as the officer’s pistol, which only has one side of the barrel sculpted. Despite the attempt to eliminate excess plastic by making everything so flat there still remain some examples, although the almost complete absence of flash is much more impressive. This set certainly has some good points. Everything is accurate and there is little trimming required. The large flag is in fact the correct size - something not always achieved in figure sets - and as it is completely unfurled and almost flat its unengraved surface could be easily painted in any required design. However these figures are flat and unappealing, and simply do not match their very specific billing, which is the biggest disappointment of all in our view.